This review has not yet been approved by the owner of this writing service. If you are the webmaster of Thesis-writing-help.co.uk, please Contact Us to approve or remove this review. From this website you may get some idea of the service’s pricing policy… and it is about all it’s good for. If you want to know any additional information or to place an order, you have to use e-mail. The situation doesn’t get better after you create an account, because there is no such possibility here – all your orders and communication with the service are done via e-mail. This means you have to keep track of all your orders yourself. Very considerate of them. Prices for essays range from $16.49 per page to $35.49 per page, depending on the assignment’s academic level, closeness to deadline and overall difficulty of the task. The last factor seems to be the most important, because the sum total of your payment may be quite different from what you see in the price list. As the customer support states, it only enumerates approximate prices, with the exact fee being determined separately for every assignment. The only way to contact the service is via e-mail. There is a query form, but as it sends an e-mail anyway, the only difference is that you don’t have a copy of the message you’ve sent after you send it. The reaction of the support is quick, however – they really seem to be working 24 hours. 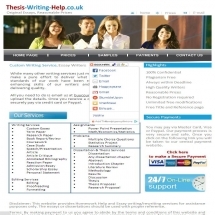 The service shows you a number of assignment samples taken from different disciplines. They, however, are far from being a homogenous set. Some are clearly written by people who seem to know their onions, but the others are barely satisfactory at the very best. Grammar mistakes, repetitions and poor choice of words abound. And although most of the texts are not all that bad, there is not a single one you could call a really impressive piece of writing. You can ask for a specific language style to be used by the writer. The absence of refunds makes this otherwise mediocre writing service to appear outright suspicious. What are you supposed to think about an agency that from the very beginning says that it won’t give you your money back if they do their job poorly?